We’d like to invite you to a live radio recording, reading & conversation this coming Saturday December 2 at 1pm at Betalevel in Chinatown. Writers Del Ray Cross, Susan Gevirtz, Suzanne Stein, Stephanie Young and Magdalena Zurawski (whose work appears in the new anthology Bay Poetics edited by Stephanie Young) will be our guests on LA-lit, a radio show co-curated by Mathew Timmons & Stephanie Rioux. The show (& hence the recording) lasts a little over an hour and will be about 30 minutes of reading & about 30 minutes of questions & answers/further questions – alternating between the two modes in hopes of creating a space for dynamic conversation. After the recording of LA-Lit, please join us for an informal Salon with our guests until 6pm. 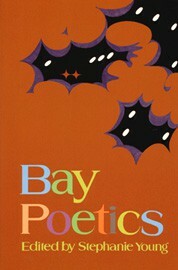 This will offer you a chance to chat with Bay Poets, there will probably be more readings and other general merriment. Also, please feel free to bring snacks andor drinks. Del Ray Cross edits SHAMPOO a sudsy online literary magazine, and thrives in San Francisco. He has a chapbook and a half available from Pressed Wafer (including Cinema Yosemite) and a couple postcard books from Poetry Espresso (with Stephanie Young and Cassie Lewis). Susan Gevirtz was an associate editor of HOW(ever) a journal of modernist/innovative directions in women’s poetry and scholarship, on the editorial advisory board of the journal Avec, and the online journal HOW2. Her books include Hourglass Transcripts, Burning Deck, 2001, Spelt, collaboration with Myung Mi Kim, a+bend press, 1999; Black Box Cutaway, Kelsey Street Press, 1999; Narrative’s Journey: The Fiction and Film Writing of Dorothy Richardson, Peter Lang, 1996; PROSTHESIS : : CAESAREA, Potes and Poets, 1994; Taken Place, Reality Street, 1993; Linen minus, Avenue B, 1992; and Domino: point of entry, Leave Books, 1992. Suzanne Stein’s works have appeared in the publications Mirage #4/Period[ical], Commonweal, Small Town, The Bay Area Poetry Anthology, and at the venues Refusalon Gallery, the San Francisco Exploratorium, the Berkeley Art Center, Outpost for Contemporary Art, and elsewhere. She is the former co-director and film curator of four walls gallery, San Francisco. Stephanie Young lives in Oakland and works at Mills College, but she’s also a resident of the internet, and you can find her there at The Well Nourished Moon. She is a board member at Small Press Traffic, San Francisco’s 30-year-old literary arts center. She also hosted a popular series of poetry readings at her house in Oakland for several years, and is the editor of BAY POETICS, an anthology out from Faux Press. Her writing has been published in Pettycoat Relaxer, Five Fingers Review, VeRT, Shampoo, Mirage Period(ical), Cypress Magazine, LIT, can we have our ball back? and Combo.